Several Apple users have reported that they have been receiving error messages when they try to update their iPhones or iPads. This appears to be one of the most common issues an Apple user faces when they update their device. It is very easy to update your Apple devices wirelessly. If you are trying to install the latest iOS software, go to your Settings, then select General followed by Software Update. If you are unable to update your device, you may also have this same problem. Apple does release updates for its various devices very regularly. Any software updates for the iOS are released through over-the-air updates. The releases often include fixing any bugs in the software, adding additional features, and improving it. This means you should update often, as there is likely to be an important new update released. 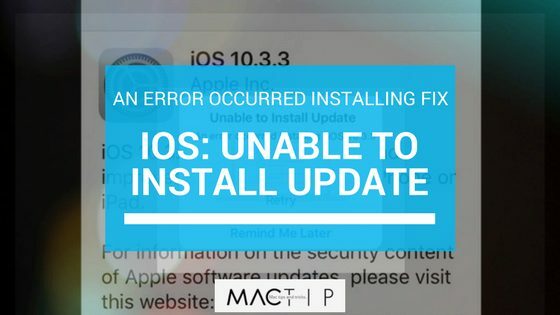 However, if you get an error message that pops up on your device that says, “Unable to Install Update: An error occurred installing iOS …,” it will make it so you cannot update. In this case, there are a few ways to fix the problem on your own. This is the first and easiest step for you to take. Simply turn your device on and off to see if that helps to solve the problem. If not, continue reading. Before installing the update, make sure that there is enough space left on your phone for you to download and install an update. If you do not have enough space, you should start by removing any content you don’t need or use. The easiest way to do this is to go into your Settings and select the General option. Here, click on Storage & iCloud Usage followed by Manage Storage. If you turn on the iCloud library, you can reduce how large your photo library is. This may sound a little odd, but I will explain. You can do this step by going into your Settings. Click on General, then Storage & iCloud Usage, and finally Manage Storage. Once you have made it into the final menu listed, tap on the iOS update and select “Delete Update.” Go back to Settings and select General followed by Software Update to try installing the update again. If you have iTunes on your computer, you can manually update your device. Check to see if you have the latest version of iTunes installed before launching it to update your Apple device. Once iTunes has been launched, connect your iPad or iPhone into your computer with the USB to Lightning cable. Select your device in iTunes and click on Summary. Click “Check for Update” once you are on the Summary page. You should see an option that says, “Download and Update;” this is the option you need to select. If you do not see this option, it is possible you are in the wrong menu. It may ask you to enter your passcode as well. If the other options have not worked so far, this may be your best bet. If you are at this point, it is likely that you have been blocked from doing most things on your Apple device due to the update error. It is very simple to do. If you own an iPhone 7 or a newer iPhone, press and hold down the Sleep/Wake and Volume Down buttons at the same time until you see the Apple logo. For earlier models up to the iPhone 6s, as well as any other iOS device, press and hold the Sleep/Wake and Home buttons down until you see the Apple logo on the screen. Download the IPSW file for your particular device onto your computer. Then connect your device to your computer and open up your iTunes application. Go into the Summary page and hold down either the Shift key if you are on Windows or the Alt/Option key if you are on a Mac. Then you should be able to click on Update. Once this has been done, you need to find and select the IPSW file you have downloaded. There are several ways to fix error message that pop up without going into the Apple store and requesting help. It is also always the best idea to start off with the simplest solution first; generally speaking, this is turning your device off and on again. However, they may not always work in fixing the problem. If none of the solutions listed have helped you, call Apple support, tell them your problem, and let them know what you have tried so far. a] bewaar al je wachtwoorden. Nu is de foutcode verdwenen en je gewoon updaten. Installeer programma’s met gebruik van je wachtwoorden en je krijgt allea weer terug.